Midwest Death Rattle. Photo courtesy of the band. Midwest Death Rattle is a group of Milwaukee musicians with a somewhat different take on the world. While a lot of bands stick with the more traditional motifs of lost love, rebelling against their parents’ generation, I just wanna party etc., these guys are talking about doom. Nick Perow is the front man, playing guitar, singing and writing lyrics that remind me variously of The Cramps, Alice Cooper, The Beatles (when they were really high) and Pink Floyd, among others. The other band members are: Derek Mantz on drums, Chad Szopinski on guitar, Ryan Peters on bass and John Dykstra on keyboards. Founded in the final year of the Mayan calendar, appropriately enough, the band’s songs have a lot to do with destruction, doom and cannibalism. Yet somehow, I don’t find their music to be really dark. It’s more of an inevitable, I-told-you-so kind of vibe. They see things going on in the world around them that they refuse to put a candy coating on. I suppose there is artistry in candy coating, but for those of us who like things sugar-free, Midwest Death Rattle is intoxicating. They have a sound that is so much more professional than many local bands, it’s almost a shame they’re a kind of “niche” band that may never have a huge nation-wide following. 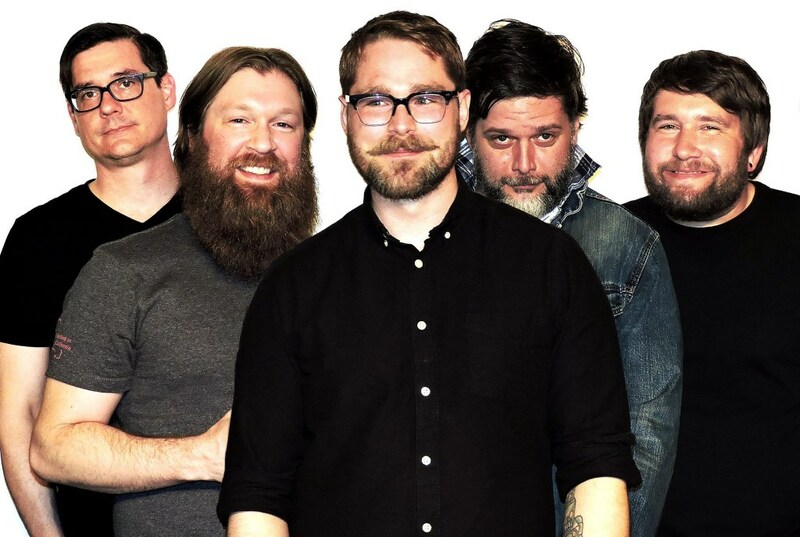 The group released a self-titled album in 2012 and a 2016 sophomore effort, Post-Apocalypso, which “doubles down on the nervous edge of the band’s debut with even gloomier examinations of anxiety and alienation, set to an ever-shifting backdrop of post-rock, art rock, funk, punk and stoner rock,” according to Shepherd Express writer Evan Rytlewski. The band has been together since 2012, but we’ve been playing together for more than 10 years. We had all outgrown our previous band. It was a tough move, but we scrapped an entire record and hit reset. Getting everyone working towards the same goals and sound was huge for us. How did you come up with Midwest Death Rattle as a name? It’s tangentially related to an Evel Knievel poster “All-American Death Dodger”, which would have been a great name on its own, but the Knievel family is a litigious bunch, so we went our own direction with it. It’s kind of a reaction to growing up around some much “Midwest Nice”, and our need to challenge it. Who are some artists that have inspired you or influenced your music? We have pretty diverse music influences. In no particular order: Talking Heads, Modest Mouse, Future of the Left, Man Man and Queens of the Stone Age. Who else do you like or listen to? Lewis and the News, or something totally obscure. How does your creative process work? Do you start with music and then add lyrics? We tend to start with music and explore a lot of ideas. Most of the time, lyrics will play off the mood of the song. We’ve been working with horn sections lately, which has been really rewarding. Our Summerfest set included a four-piece brass band, which sounded huge. What’s it like in the studio when you’re working? Over the course of few years, we’ve built a studio rehearsal space. It’s great for tight sounding recordings, but we wanted something bigger sounding on this record. Fortunately, we were able to use a friend’s warehouse studio to track drums to tape. Soul Low, the Fatty Acids, N.A.N, Webster X, The Pukes, Tigernite, NO/NO… kind of too many to list lately. Yes, but we’re working on branching out in the months to come. What about upcoming performance dates? September 3rd at The Frequency in Madison, and we’re working on something big for Halloween. We’d like to have an EP out early 2017. We’re working on the music now. How about your plans for the future? For the most part, just trying to play for more and more people. Also, it’d be great to get a music video out for this record. Is there a prevailing theme? One of the first things we did when we started Midwest Death Rattle, was to outlaw the word “fine”… or the feeling… as in, “yeah, that part is fine, I guess…” Don’t be just “fine” with something when it’s within your control to change it. Also, if possible, make it a party.